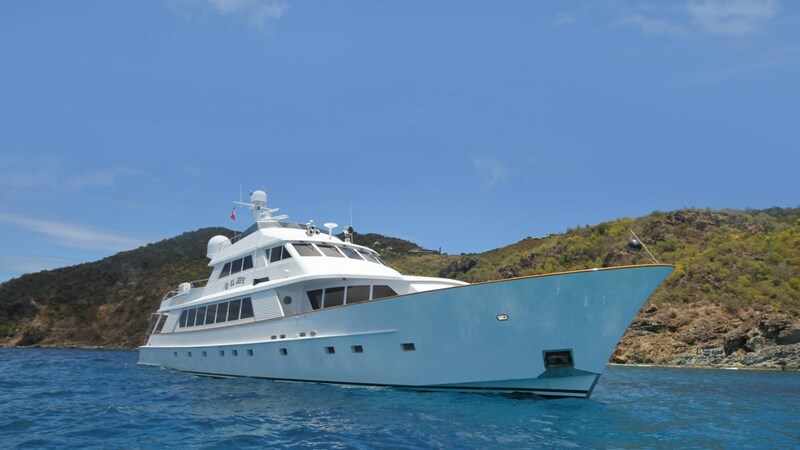 Luxury Motor yacht El Jefe (previously "Lady Frances") was built in 1989 by Derecktor Shipyards and has had a multimillion dollar full interior and exterior refit in 2007. 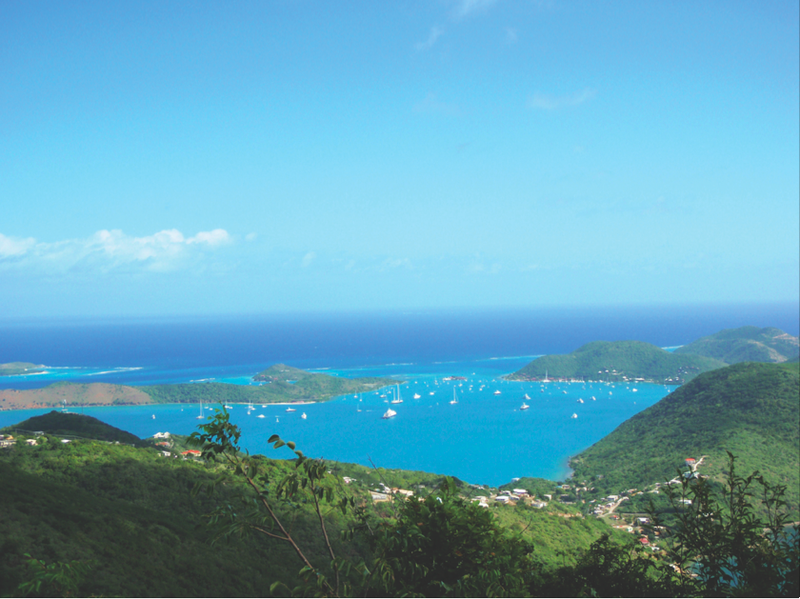 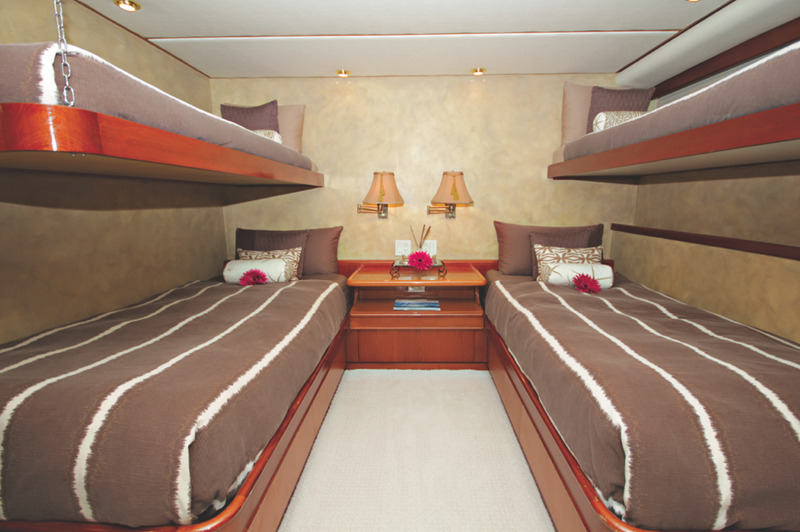 She is based in St Martin, the Caribbean during the winter and in the Bahamans during the summer and can accommodate 8-10 guests in 4 cabins. 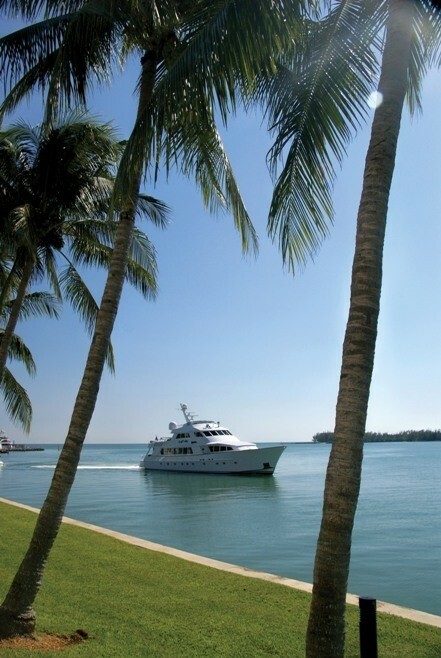 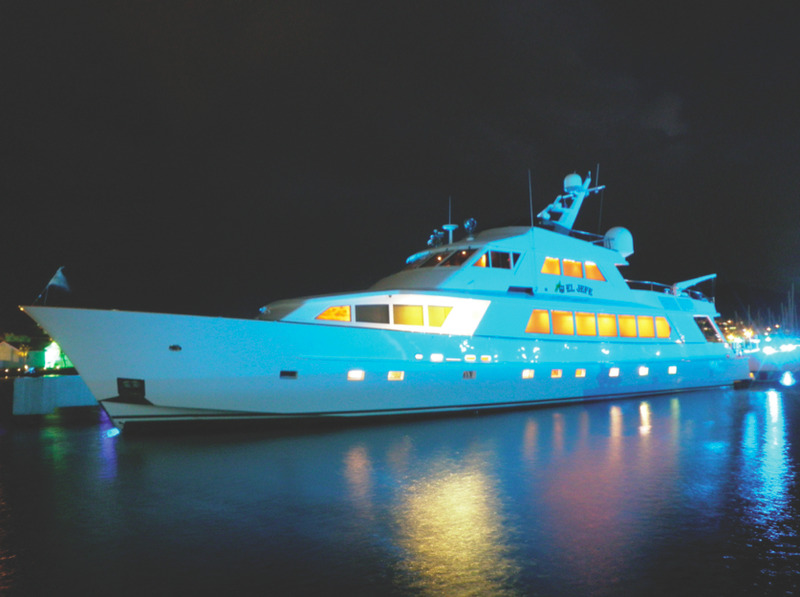 EL JEFE is a luxury motor yacht measuring 115ft in length. 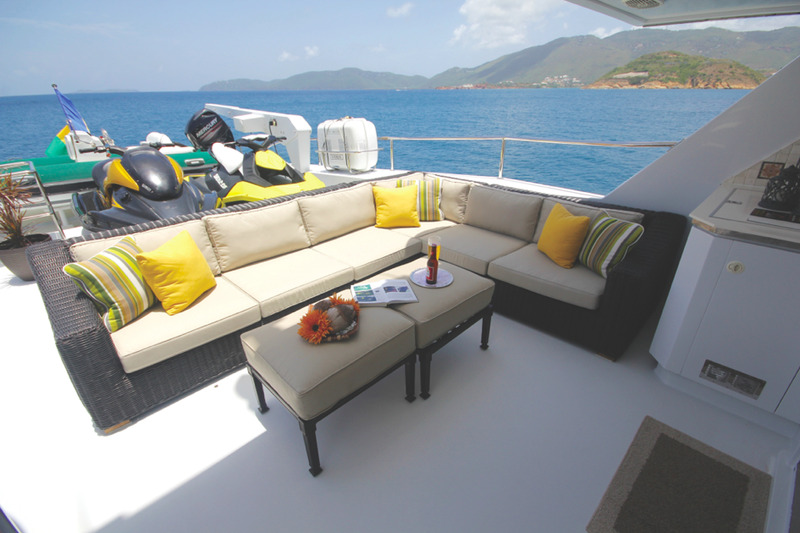 This tri level yacht has plenty of space both inside and out. 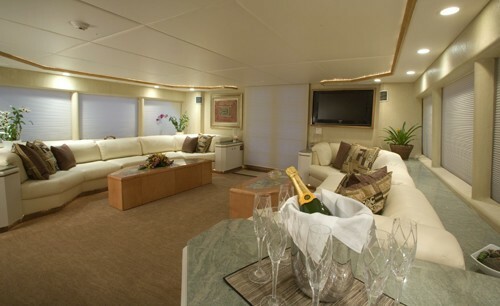 Her main salon has a comfortable socializing area with Custom white leather sofas, coffee tables and built-in cabinetry and Sony Entertainment Center with a 40” flat screen Sat TV, DVD, CD and MP3 ready. 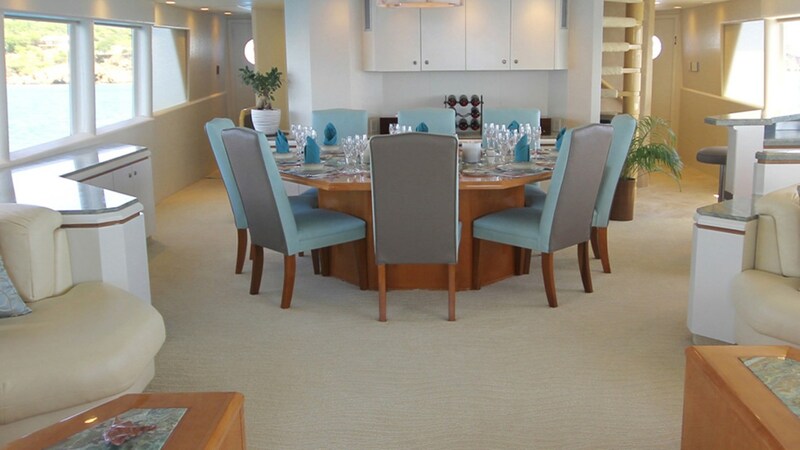 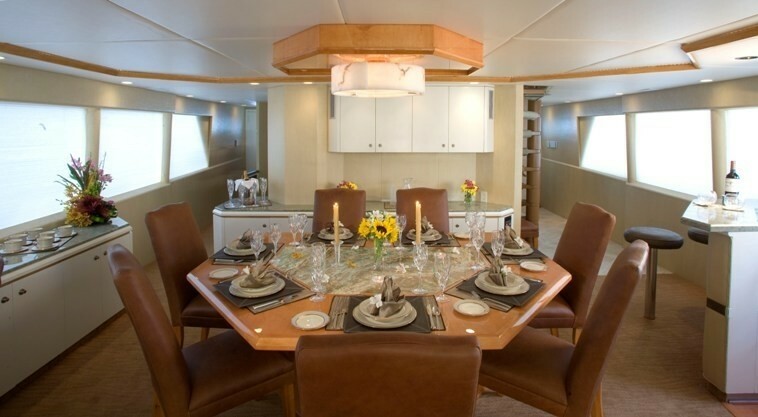 The saloon is adjoined to the formal dining area midship, which can comfortably seat up to ten guests. 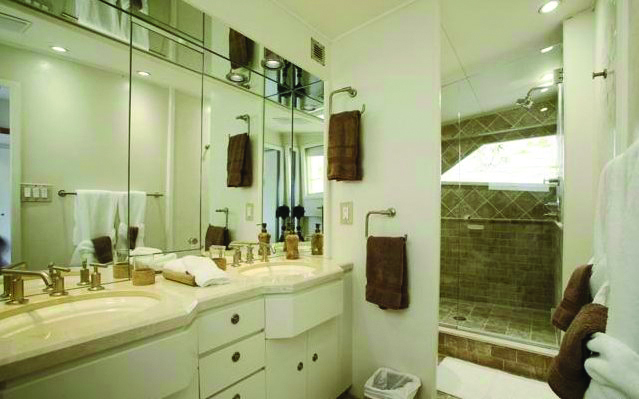 This area also has custom granite counter tops. 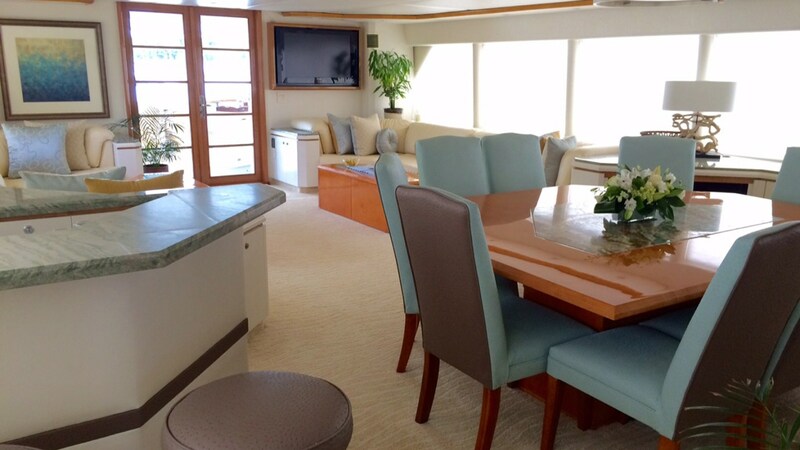 Refrigerator, ice maker and Bar stool seating for two. 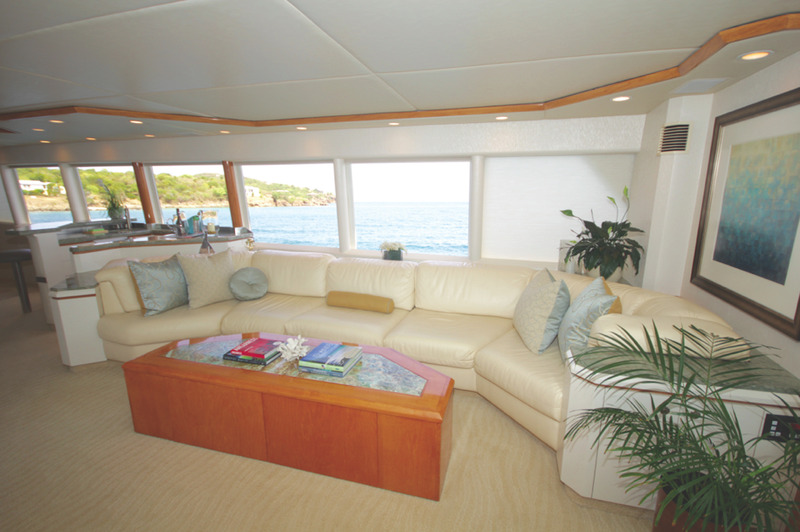 The Sky Lounge on the next level has an L-Shaped Settee with Custom wood and granite coffee table. 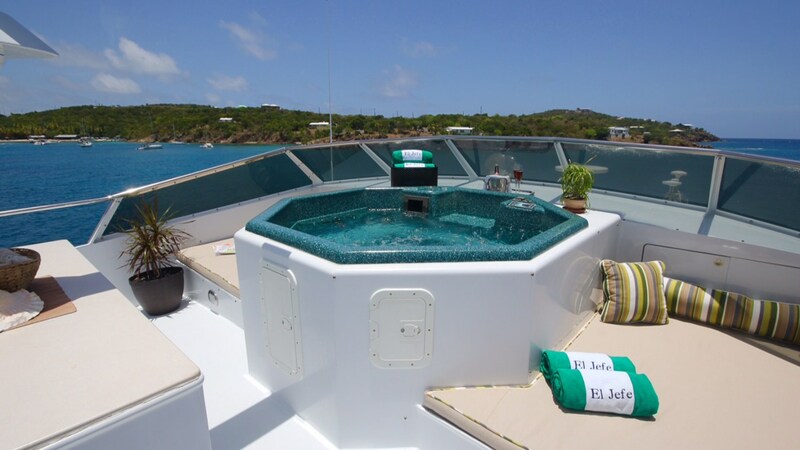 There is also a large full service wet bar with new refrigerator/icemaker and seating for four. 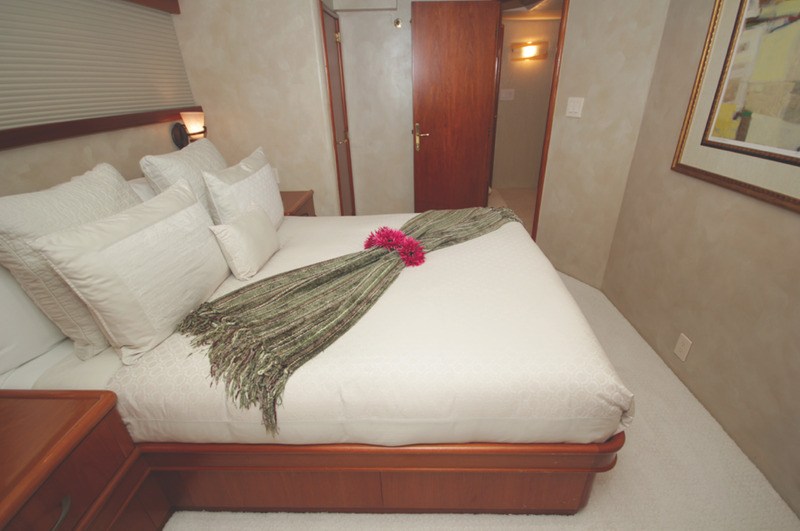 The area is also equipped with a Full entertainment system with Sat TV/CD/DVD and MP3 ready. 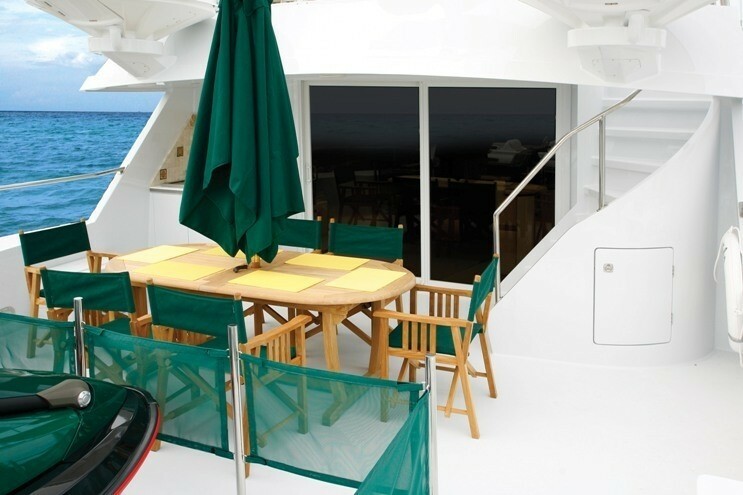 French doors open to Aft from the Salon. 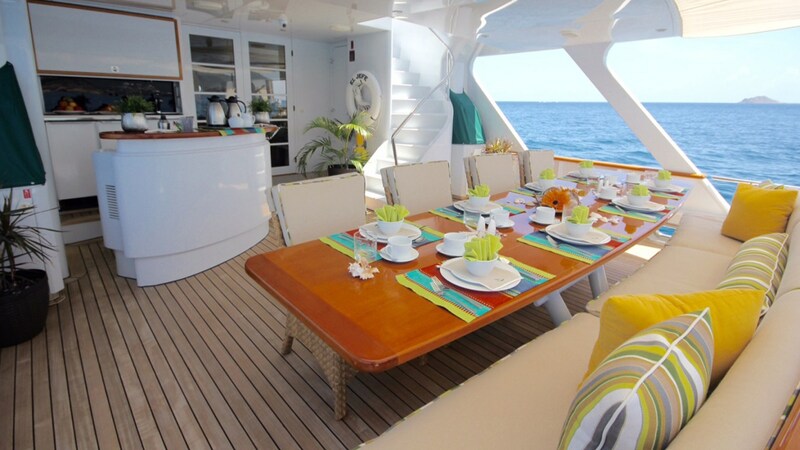 The new large 'el fresco' dining table seats 12 guests. 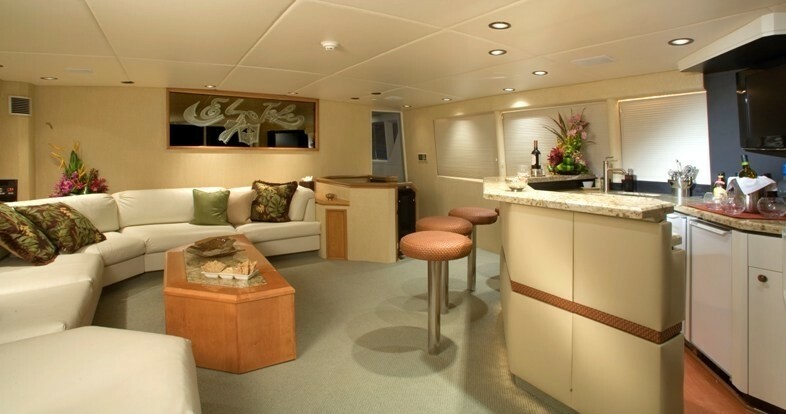 There is also a full service wet bar with Scotsman Icemaker and Refrigerator. 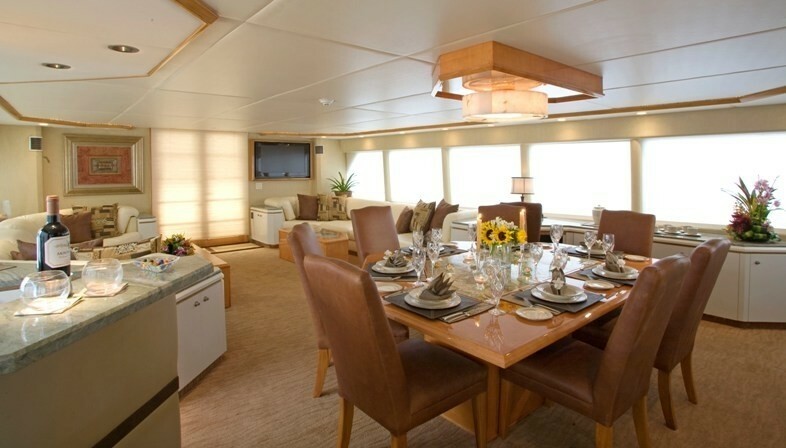 32” flat screen TV, a JenAir Grill. 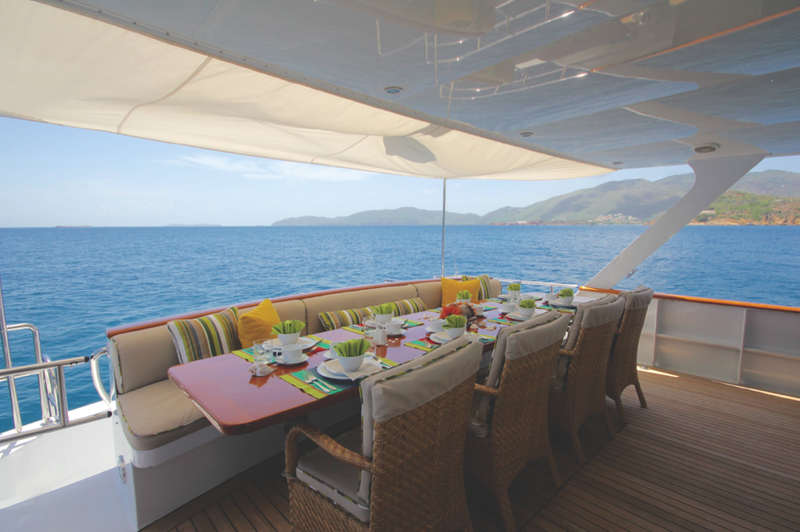 The Aft Deck has also had a wing extension with Euro style Transom for easy access to the swim platform and entry for water toys and diving. 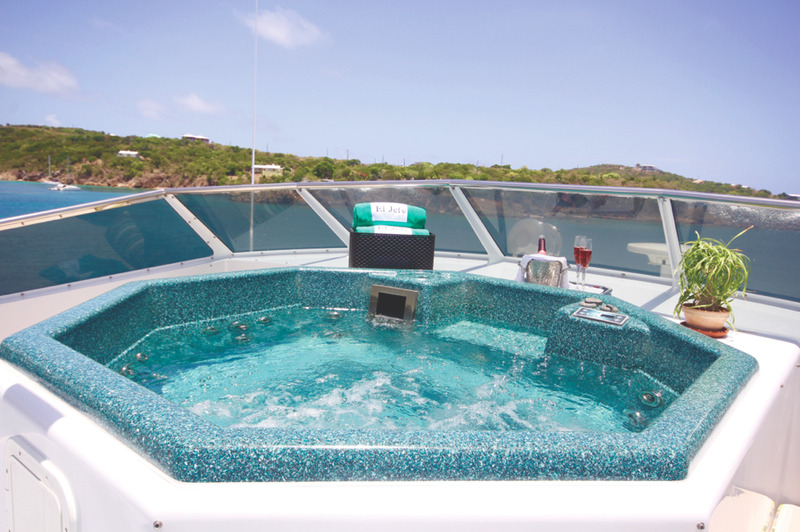 The Flybridge boasts an 8-person Spa Pool hot tub with 360-degree panoramic view. 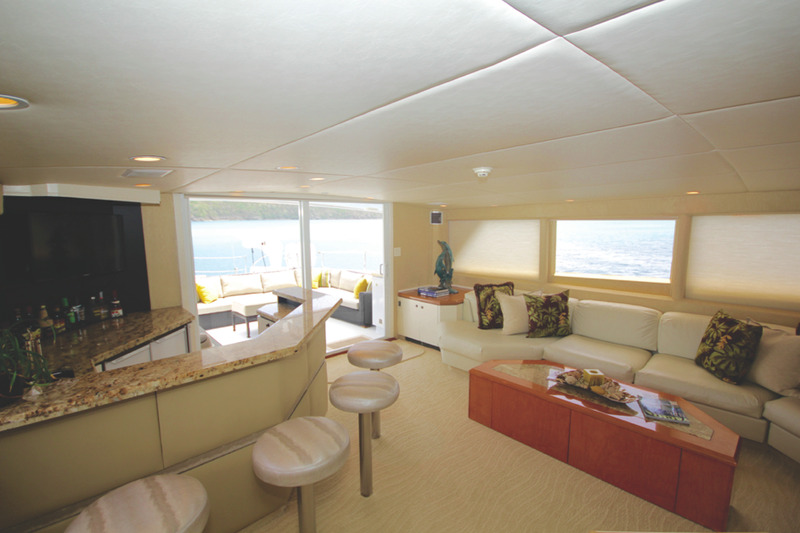 Another Full service bar area and multiple sun pads for lounging. 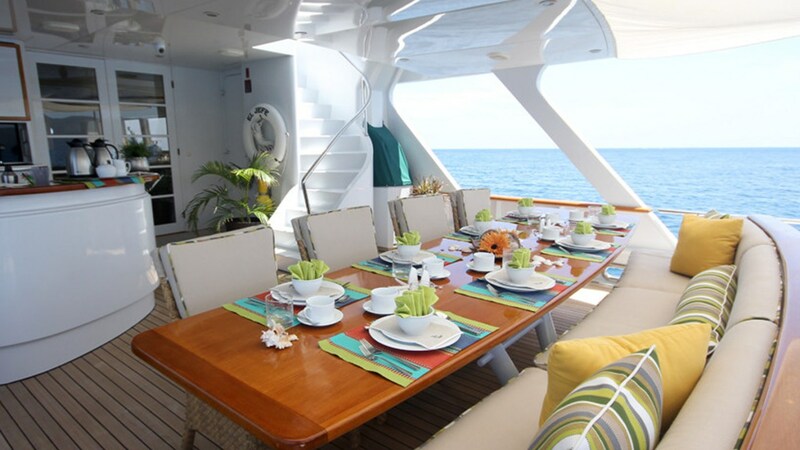 On the Boat Deck there is a new teak table with seating for 10. 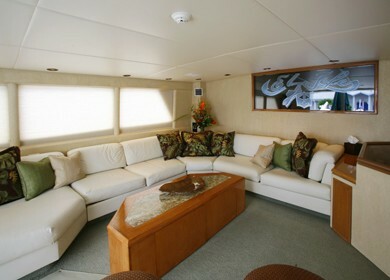 A 32” flat screen Sat TV, DVD and a new Fire Magic Grill. 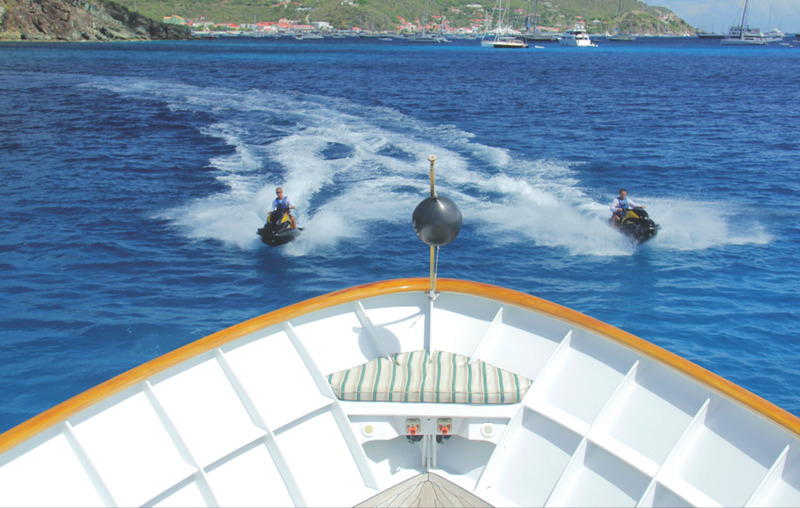 This area is also where the 2 new stand-up, sit down Seadoo Jet skis. 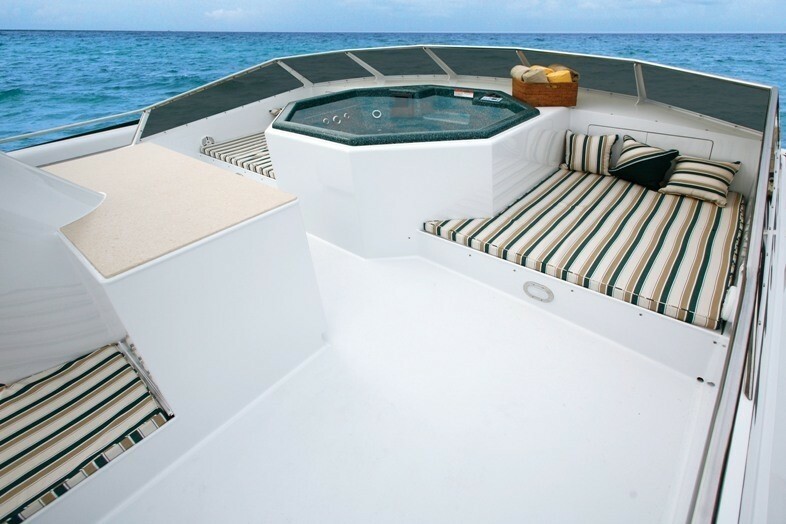 15’ Caribe Tender 60hp Yamaha are stored. 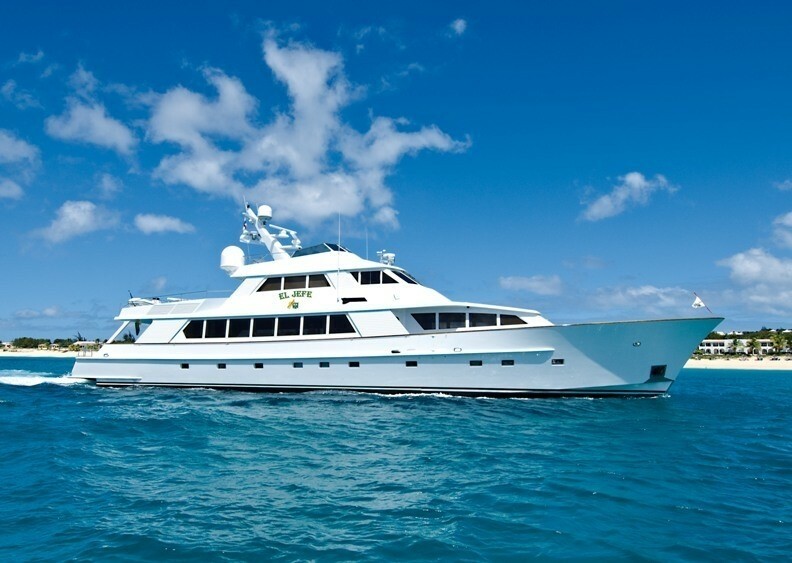 Motor Yacht EL JEFE comes complete with a 28’ Mako, Ricochet that is equipped for snorkelling, diving, deep sea fishing, waterskiing and other shore side activities. 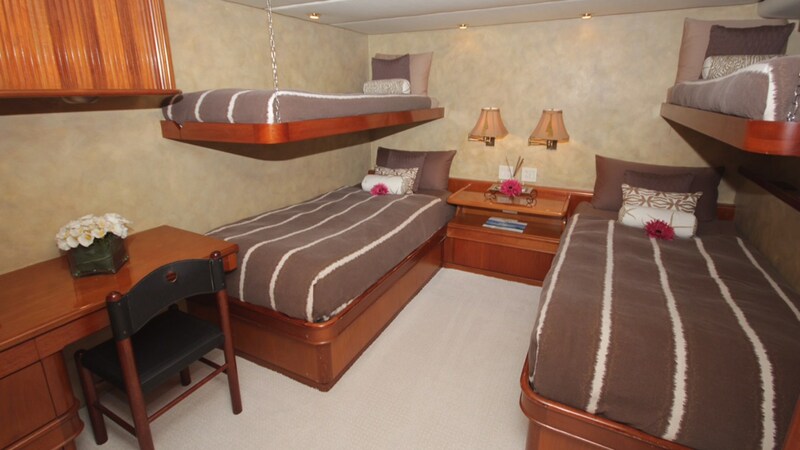 Other amenities on board include worldwide central WIFI communications, TV, fax and phone. 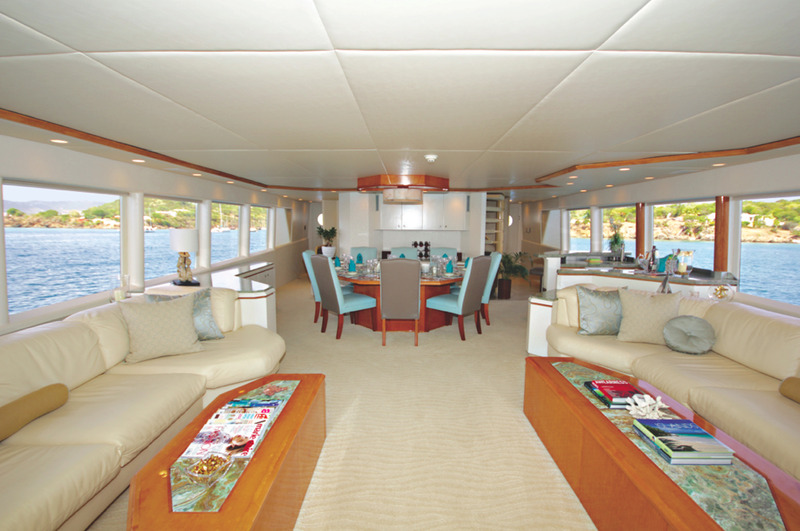 The entire yacht is centrally air-conditioned. 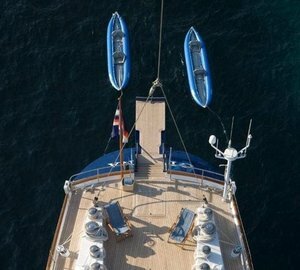 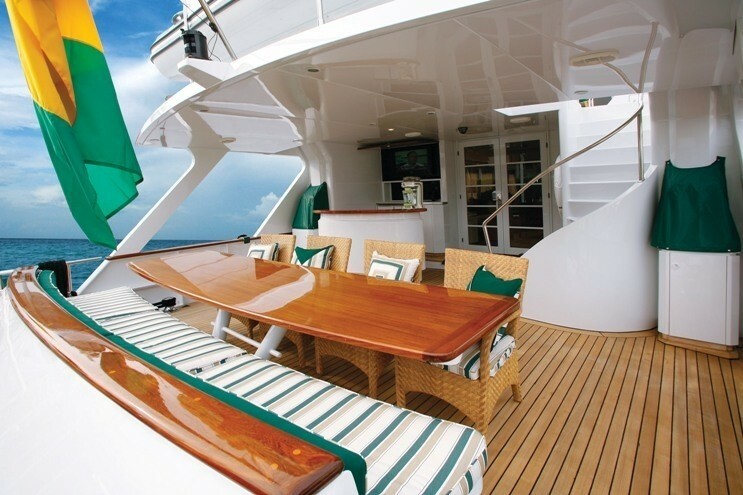 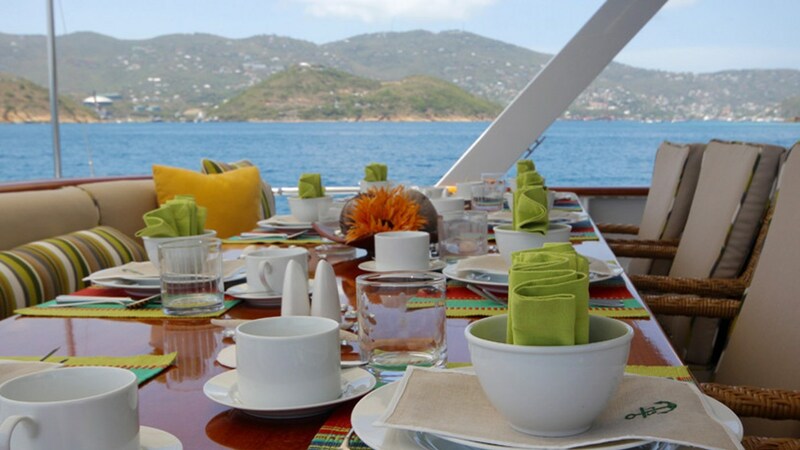 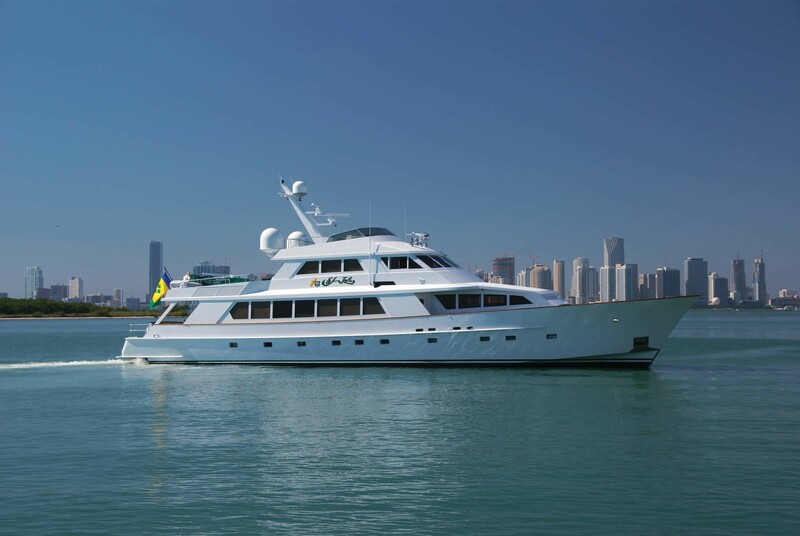 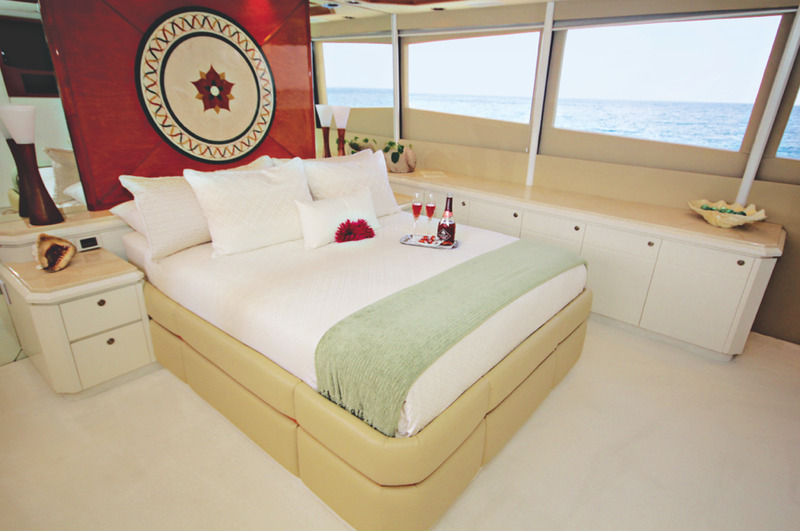 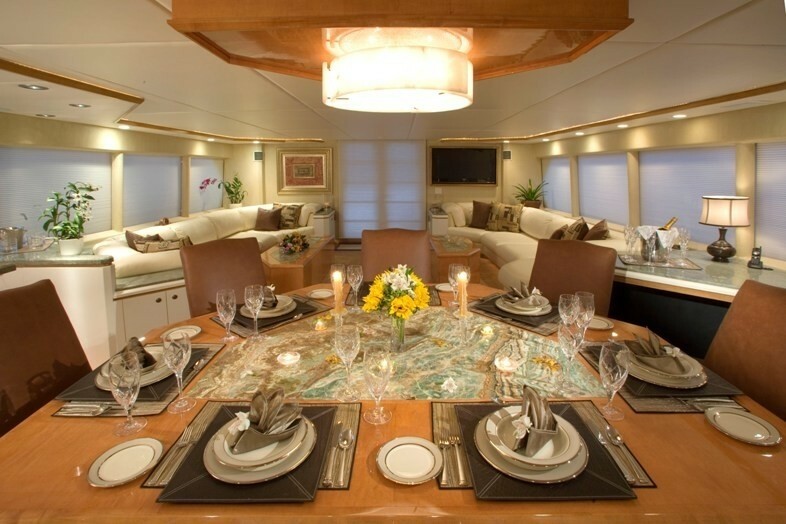 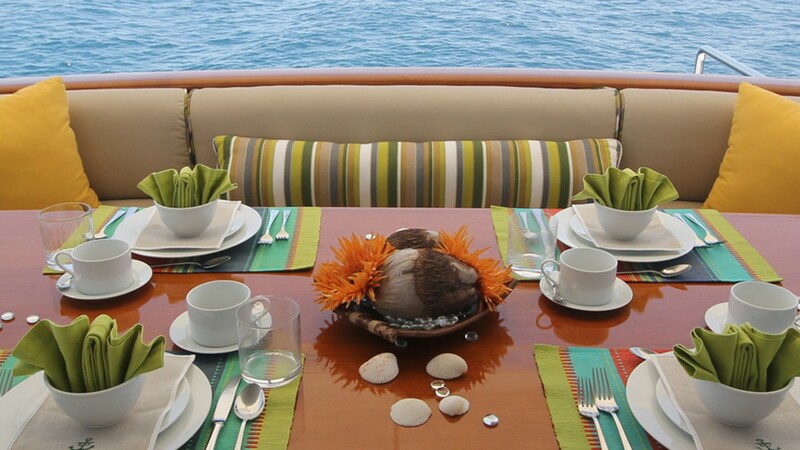 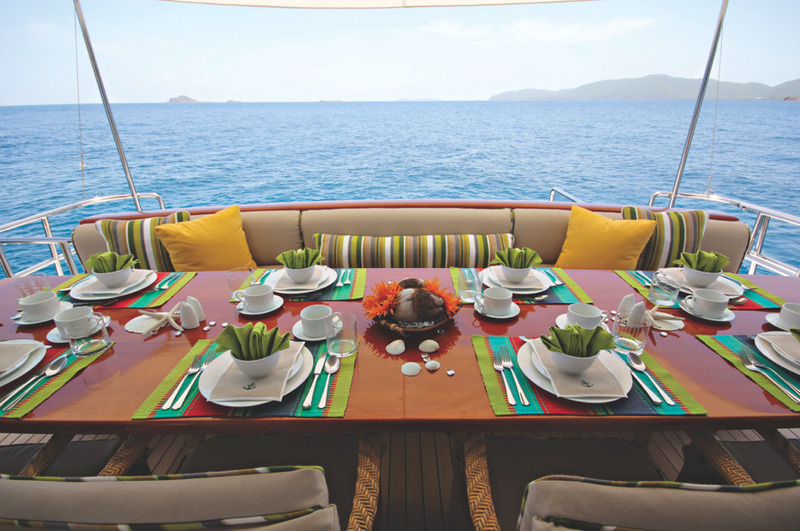 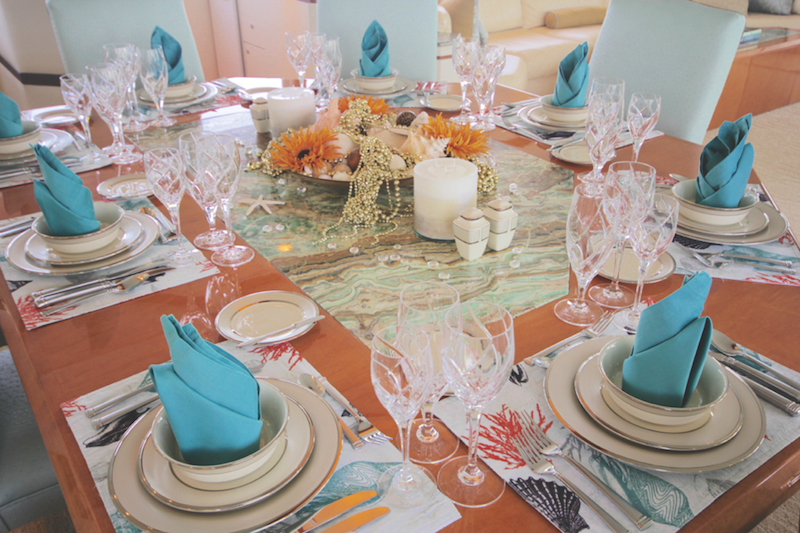 Luxury Motor yacht EL JEFE can accommodate up to 10 guests in 4 cabins. 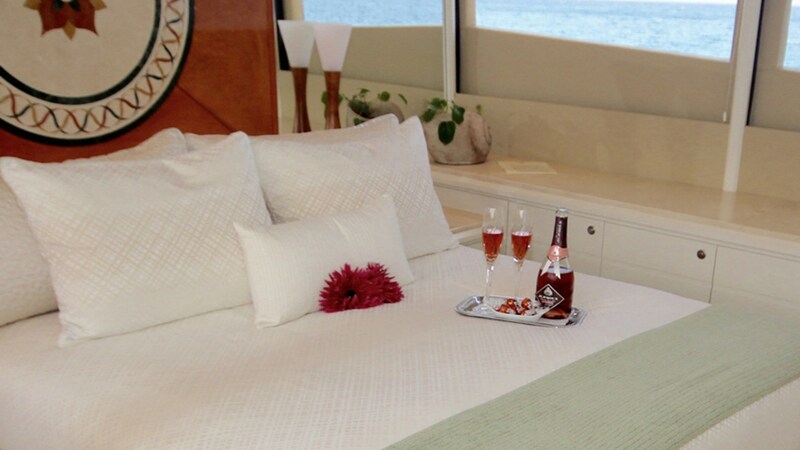 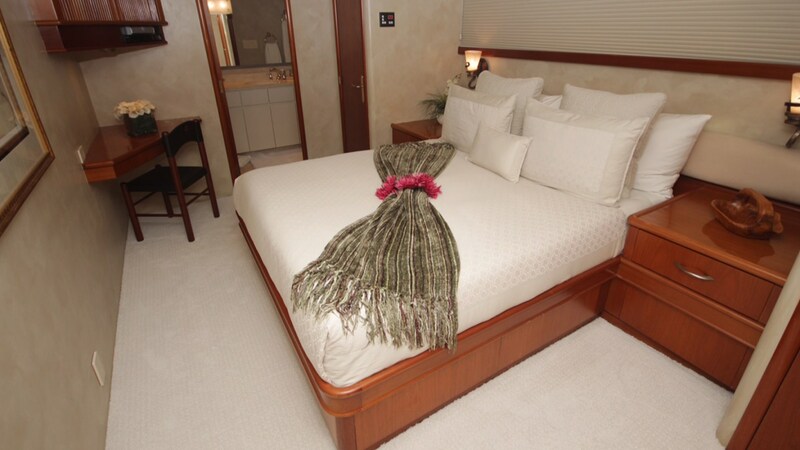 The master stateroom located forward on the Main Deck has a Queen bed and a State of the art body spray shower. The two VIP Queens staterooms located Aft, pictured below; also have a Body spray shower and built in cedar lined closets. 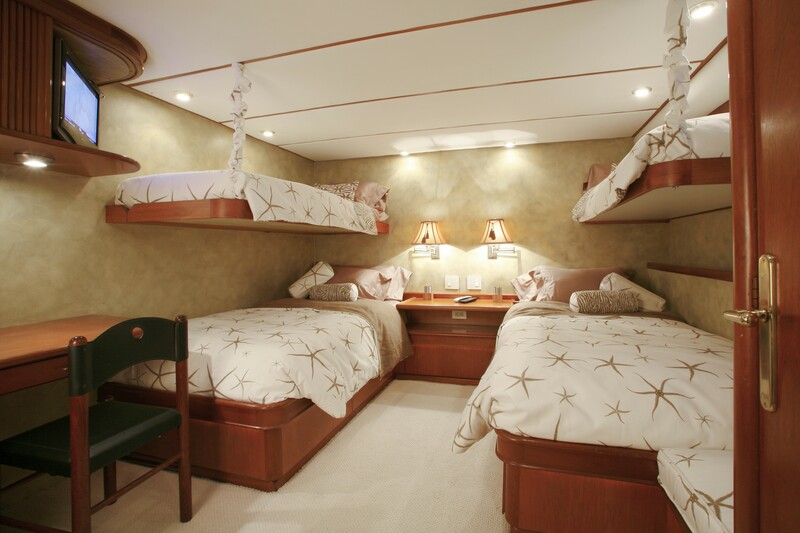 The final Cabin is a twin with 2 additional Pullman bunks that are suited for children only. 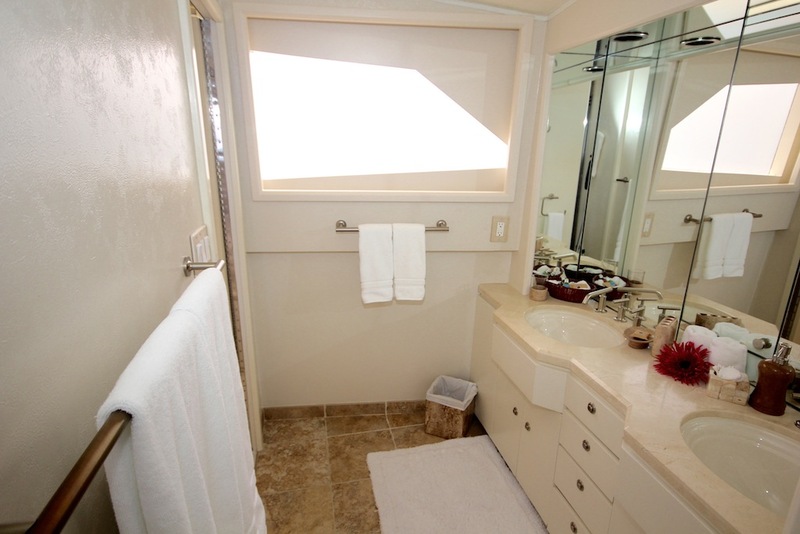 This cabin has a Shower. 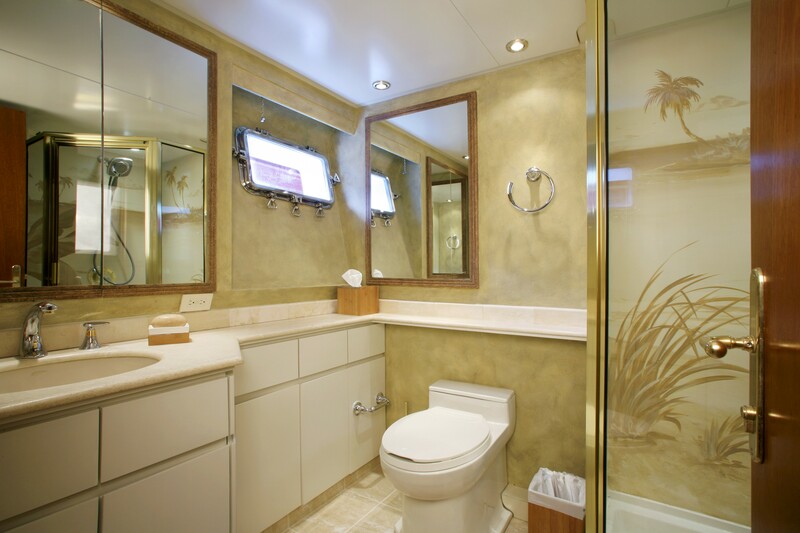 All cabins have a Flat screen sat TV/DVD/CD and are MP3 ready. 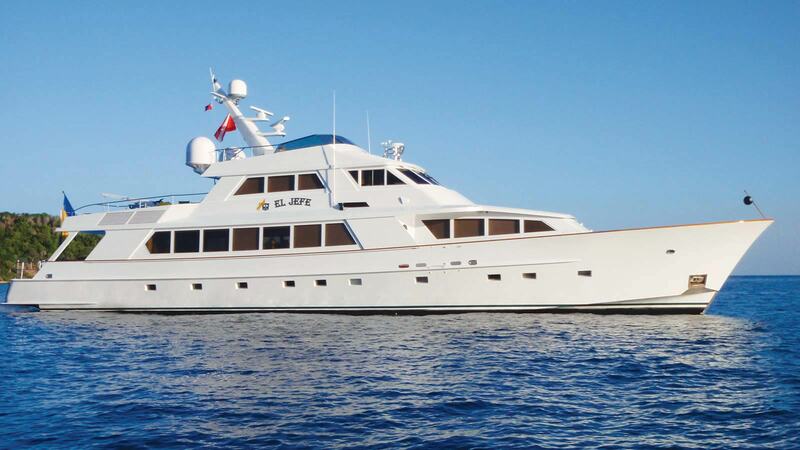 Luxury Caribbean motor yacht El Jefe has the following tenders, toys and amenities: 29' Sea Fox, 15 ft / 4.5 m Caribe / 60 hp, 2 x Seadoo jet skis, wake board, trampoline, 2 x SUP, 2 x 2 man clear bottom kayaks, snorkeling gear, water skis, fishing gear, waterskis. 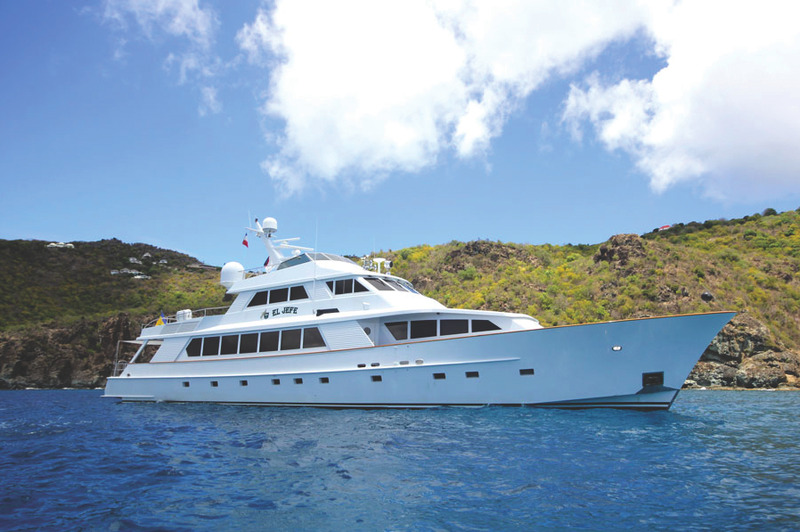 "Fisherman’s Delight"-US$500/day addition fee for use of 35ft / 10.6 m Marlin / 2 x 250 hp equipped for deep sea fishing. 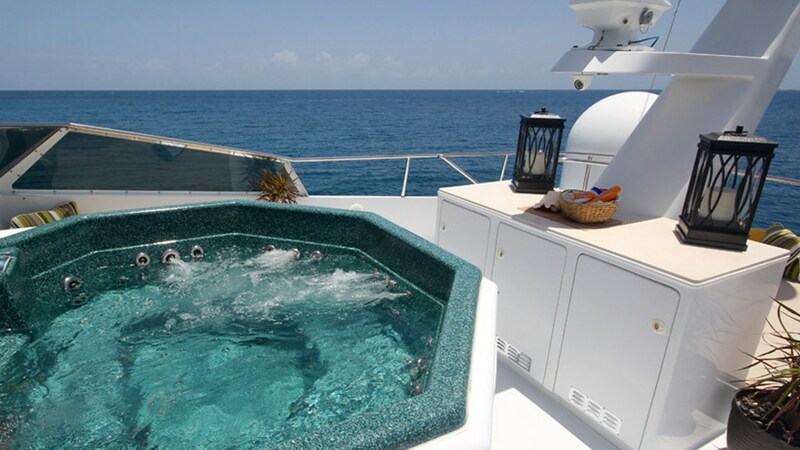 Available for St. Maarten charters only. El Jefe’s Communications include a SAT COM, Fax Machine, Internet and email, World wide WIFI. 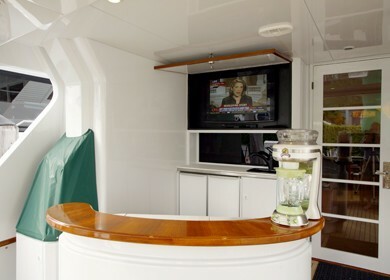 Audio Visual Equipment and Deck Facilities include a 40” & 32” flat screen Sat TV, an MP3, She is Ipod accessible and has a complete CD/DVD library.